When it comes to social media, do you have a content planning system? A good content planning strategy can help you sell more and launch your product, but only if you’re doing it strategically. Our guest on episode 018 of the Rebel Boss Ladies Podcast is Kat Gaskin, a Toronto-based graphic designer-turned-entrepreneur and creator of The Content Planner. She knows how important it is for digital product sellers to plan their social media content. Her product, the Content Planner, is designed to help online entrepreneurs generate buzz, get their brand out there online and create successful launch strategies. If you’ve ever wondered about how you can use social media to your advantage, this episode is a must-listen! Like many entrepreneurs, Kat didn’t always work for herself. While she was working full-time as an in-house graphic designer, she realized that if she started her own business she could work a lot less and could travel a lot more. Kat’s transition to freelancing didn’t happen overnight. She planned for a year and a half so that she’d be financially ready the day that she quit her job. Kat started out doing freelance graphic design work, and that quickly turned into content creation, working with brands, creating photos and copywriting for social media. She decided to transition again, however, when she realized she wanted even more freedom. Kat had always been obsessed with planning. She’s used a daily planner for over 17 years, and realized how important it was to plan when she started freelancing. Kat admits she’s very goal-oriented, and used her planner to set achievable tasks that she could work on every day to keep building her business. She ran into a problem, though, when she was trying to find a good planner that would help her plan her content. She tried searching for a paper social media content planner and realized that she couldn’t find a product like that on the market. Kat’s graphic design skills really helped her turn her product idea into reality. The Content Planner launched in 2016. Kat says that she and her co-founder at the time had no launch plan or marketing budget, but it was an instant success because there was such a need for their unique product. By putting a unique spin on the concept of a daily planner, she was able to create a product that people were willing to buy. She also had no competition when it came to marketing her product, because no one else had created anything like it. Even though a lot of different planners existed, none had her specific design and spin. Kat included everything in The Content Planner that an online entrepreneur and digital product seller needs to think about when creating a content strategy. She took what she needed when she was planning her own content to build a product that could work for any and every online product seller. First, she recommends that it’s important to think about your content strategy in advance. For Kat, that means at least one month ahead, because it allows her to cover all of the essential aspects of creating your content, like editing your photos, gathering hashtags and more. Planning ahead is essential when doing a product launch. Kat also emphasizes how important it is for digital product sellers to focus on goals and always have a strategy in mind. The Content Planner has a section where you can set three to four monthly goals, and a section to write down important dates that are coming up, so you remember to plan for them. Finally, Kat says important to think of your business presence across all of your different platforms. She has a solution for this – the Content Planner comes with different stickers that help to visualize what your content strategy looks like for that month. 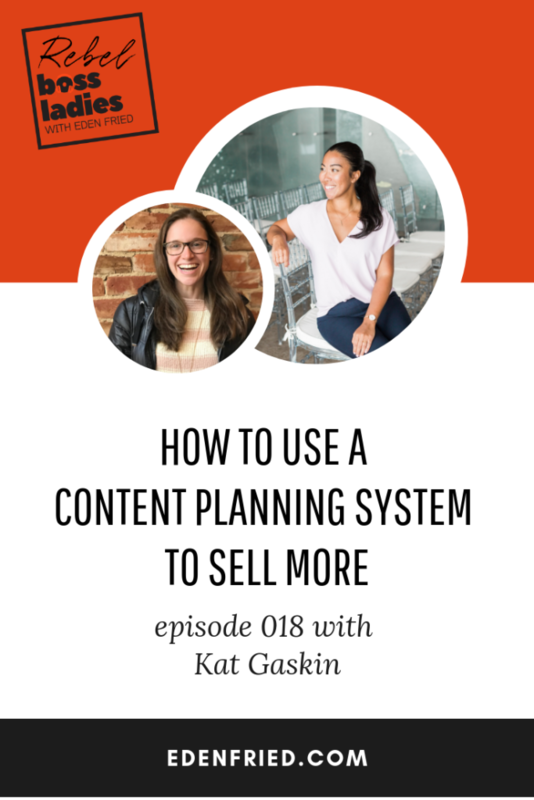 Kat knows that her product isn’t for everyone, and her goal isn’t to get the Content Planner into every person’s hand. She knows how important it is to identify her target customer and focus on building relationships with those individuals. For Kat, finding her target customer was easy because she can see her target customer in herself. “It was very important for me as a business owner to create a product that I believed in and that I used.” She uses her product everyday to run her own business and develop her content plan. Kat says that an essential part of launching a digital product is knowing exactly who the target customer for that product is. Kat also emphasizes that it’s incredibly important to continue to share good content and build positive relationships with your ideal customer. “It's all about finding your specific niche and dominating that community and serving them every single day with value and content,” she says. Even though it took over a year, Kat was eventually able to completely transition her service-based business to a product-based one. Now, with the success of the Content Planner, Kat has the ability to work with brands, travel, and have a location-independent business. Looking back to 2012 before she had started her own business, she admits “I had no idea that I would be running a product-based business… I have no experience in business. I graduated from college with a diploma in graphic design and then I went to university for media. She’s noticed some shifts in herself as her business has evolved and grown. She’s learned a lot more about herself because she’s constantly putting herself out there. For Kat, the biggest shift was she began to really value her time, skills and talents. Running a business has helped her to learn how to say no to people and create boundaries for her business and in her life. Kat created her product because she knows how important it is to create a content strategy for how you’re going to show up on social media. Depending on the type of content you’re sharing and which platform you’re using, timing is also a huge part of a content strategy. This is particularly important during a product launch. Kat recommends thinking through your launch, and planning how far ahead you need to start posting content. Thinking about where and when you’re going to post on social media, how active you need to be before your launch, and how to engage with your community is essential before any product launch. Every step of your content plan should work towards something and eventually lead towards a larger goal. A great example of this is Kat’s plan for Galentine’s Day, the day that women get together to celebrate female friendships before Valentine’s Day. She knew this day aligns with her brand and would target her ideal customer, so she had planned on having a monthly sale and built a specific content strategy around it. Kat recommends thinking about your content strategy in a SMART way, so your plan content is specific, measurable, achievable, relevant and time sensitive. If your content plan is too general, you won’t be as successful in working towards your goals. Kat knows that social media can be overwhelming, and sometimes it’s difficult to balance posting relevant, engaging, original content to so many different platforms. Waking up and not knowing about what to post and when can lead you to post something that’s ineffective, or worse, might just lead you to not post at all. When planning out your content, Kat recommends including a lot of different types of posts to keep engaging your audience. She recommends that you should limit posts about selling because your audience can get tired of this very quickly. To build a relationship with your audience, Kat recommends mixing a lot of different types of posts and captions into your content strategy. Variety is important, and alternating between many different types of content, like asking questions, sharing a business success story, talking about your brand, using a quote or posting something vulnerable, can make your audience more attracted to you and your business. Kat says that the best way to create a content strategy is to identify a platform that works best for your brand and target customer. For her, that’s Instagram. She also emphasizes that your email list is your most powerful selling tool for digital product sellers. Kat has a few different strategies to help her more build and use her email list effectively. First, she has a great freebie, which is a research library full of content-planning printables, that people can access by opting-in to her email list. She also has a free seven-day video series planner challenge where she helps participants plan everything from hashtags to strategy. Kat also stresses the importance of setting up automated sequences for your email list, because it lets you be a little more hands-off in your business. When it comes to balancing her time between email and social media, Kat knows it’s more important to put effort into her social media strategy because that’s where her ideal customer hangs out. One of the most important times for digital product sellers to plan content is during a product launch. Having a good content strategy can help you build buzz on social media and ultimately ensure your launch is more successful. Kat’s experienced both sides of this spectrum. The first time she launched the Content Planner she didn’t have a launch strategy and it was successful, but it didn’t compare to her launch in September 2018. Her content strategy paid off and she was able to make $37,000 in one week, just by planning her content and being there for her community. She emphasizes that numbers don’t always play into this. Even though she has 16,000 Instagram followers, her sales are in the six figures. Even if you have a smaller audience, you can plan your content to create a launch strategy that is successful and targets your ideal customer. Kat says that the most important aspect of creating a content strategy is making sure that you’re being consistent and sticking to your content plan. But Kat really emphasizes that you need to shift your mindset in order to make sure you’re following your content plan. Planning your content and posting are essential parts of making a profit from your business. Having a content strategy will ensure that you’re constantly in front of your customers and community on a daily basis and remind people that you’re there.